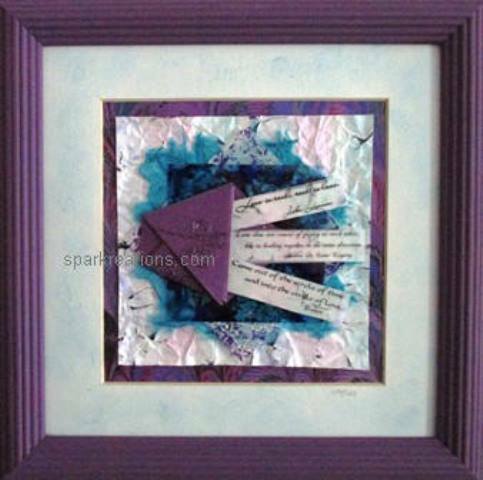 Welcome to Sparkreations — Expressive Works in Paper! (As you browse the website, hover your mouse over the photographs for additional information. Enjoy your journey perusing the artist’s creations. 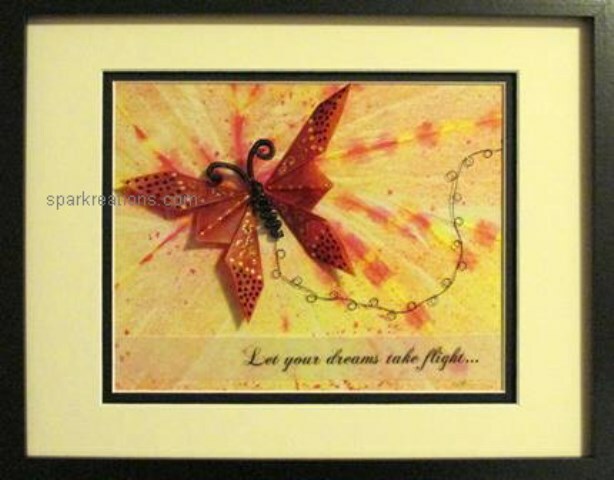 This piece was designed and made as a gift for someone who has long admired my artwork. It was presented to him with gratitude for his care and kindness. When Chrissy and Bob became engaged, the mother of the bride commissioned this piece as a gift for the happy couple. Their enjoyment of vineyards and learning about fine wine plays a part in the overall theme of their wedding. 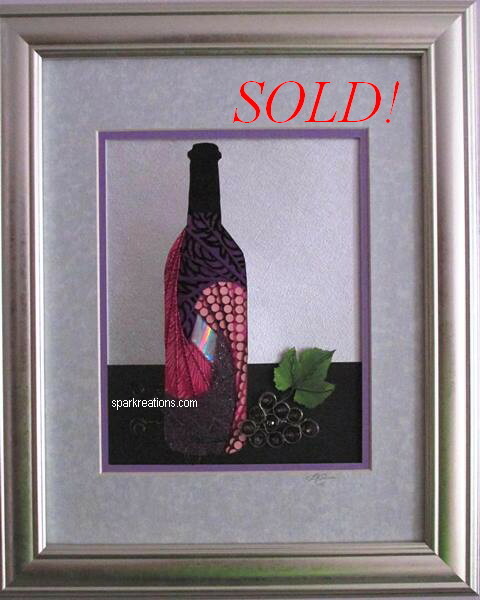 The wine bottle is fashioned from fibers and metallic materials, showcasing an array of textures. Each grape is a hand-coiled spring with a tiny crystal in the center. The inspiration for this piece came from the celebrations commemorating the 50th anniversary of the Beatles’ appearance on the Ed Sullivan Show. 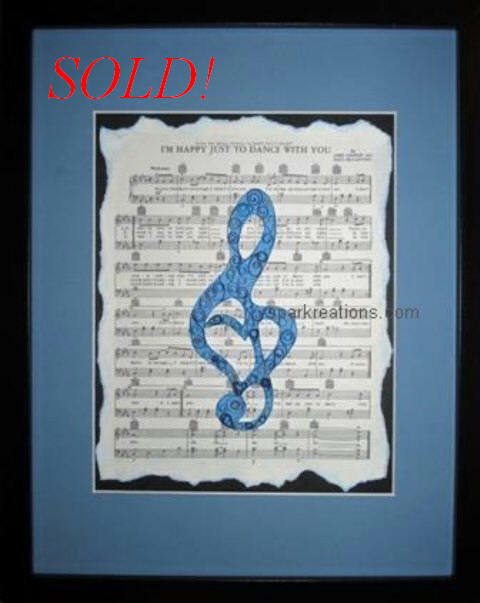 The whimsical G clef is filled with dozens of tiny quilled paper elements and is set atop the music for their hit song, “I’m Happy Just to Dance with You.” Check out more pieces of artwork featuring quilling. Love is in the air — and is expressed in this design, featuring lucky “love” fortunes, spilling out of an origami Chinese box. Underneath are 5 layers of paper, each one a different texture and most handmade by the artist. Please take a peek at her other origami designs. 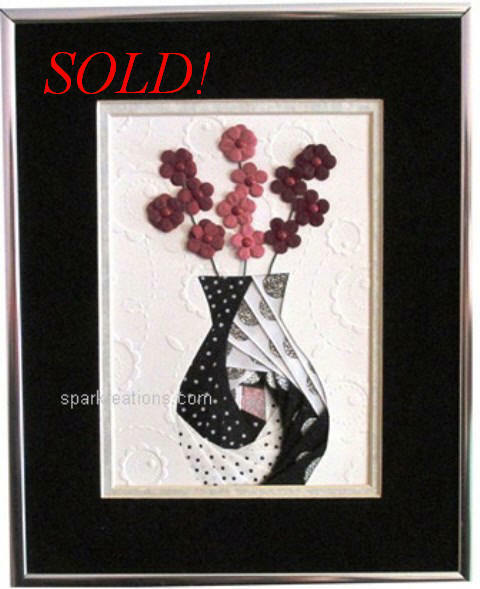 Delicate paper flowers pop against the black and white backdrop of this piece, featuring a vase fashioned from polka-dotted fibers. Take a look at some more designs fashioned from the iris fold technique. This piece began with a longing for the bright, saturated color that comes with the approaching warmer months. 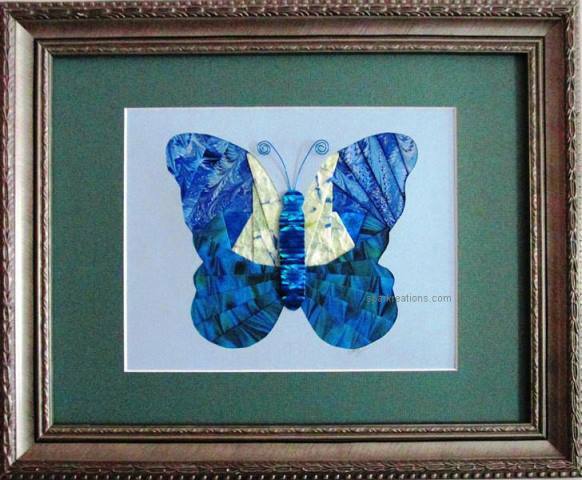 The butterfly is crafted from vellum paper that the artist hand-colored and with wire that she formed. Please take a peek at her other origami designs. Hand-marbled and holographic papers make up this butterfly, featuring a double iris fold layout. Follow the link to view more great iris fold designs. The stand-out of this piece is the gorgeous hand-marbled papers that the artist used to form the detailed maple leaf — a favorite subject of hers. 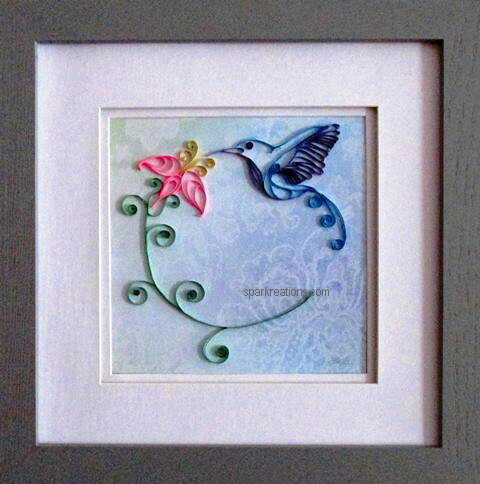 She colored the frame to coordinate with the metallic paper that she made for the center or “iris” of the design. Here are more great iris fold designs, including more maple leaves. 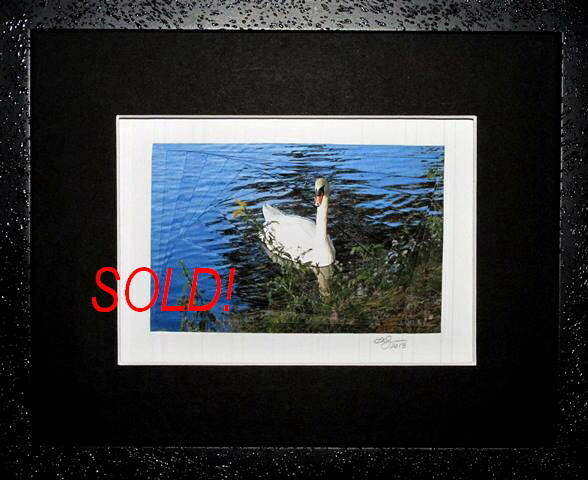 It all began with a photograph that the artist took of a lovely swan swimming in the pond on a gorgeous late summer day. This reverse iris fold was accomplished aligning multiple copies of the same photograph. Detailed touches complete the piece, including added texture to the frame to mimic water droplets, and mounting the artwork in a deep shadow box to highlight the dimension that this technique provides. Follow the link to view more great iris fold designs. Springtime was the inspiration for the subject and colors in this piece. The basket looks woven but is actually formed by combining multiple separate elements! 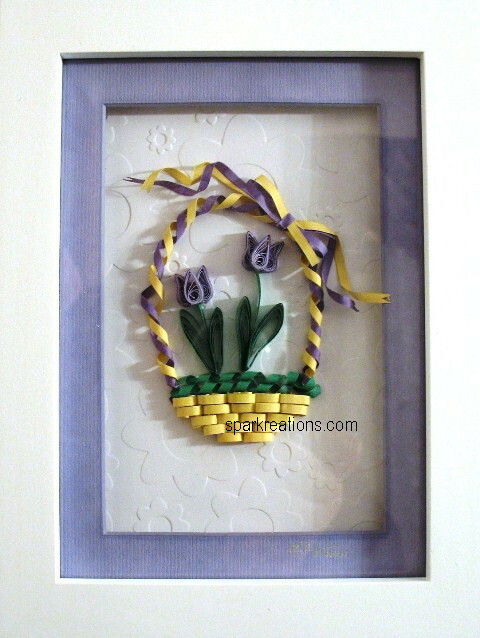 The entire work was made employing the very old technique of quilling which involves manipulating very narrow strips of paper into individual elements then combining those elements to form a particular design. Photographs cannot do justice to these artful creations. Each individual glass box is hand-colored by the artist, making no two exactly alike. 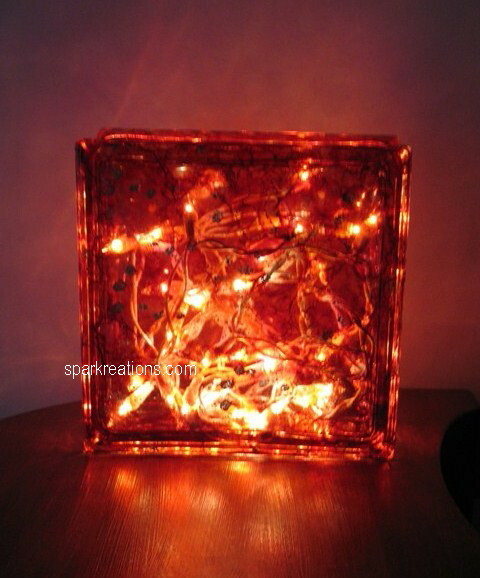 Filled with white lights, they uniquely illuminate any space, adding spectacular ambiance. They make fantastic gifts. Many colors are available for your custom design. 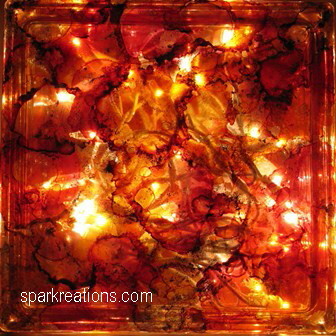 Check out more glass light boxes. Paper pulp is combined with natural fibers then formed in a mold to produce wonderfully detailed cast paper. 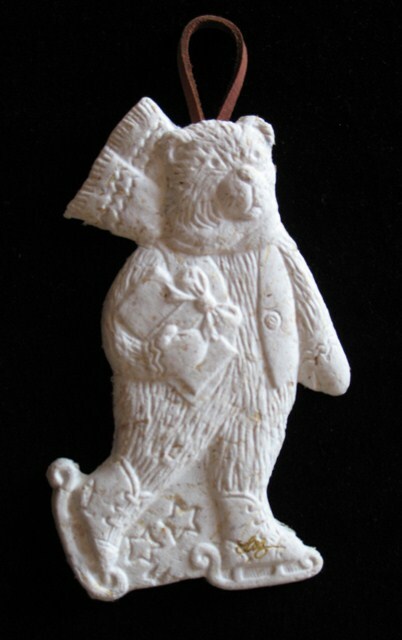 The bear ornament is a perfect compliment to a child’s bedroom. Check during the holiday season for other ornaments to decorate the tree that make unique gifts. A cascade of flowers tops this two-gifts-in-one artistic creation. After mining whatever gifts are inside, recipients often display these boxes on a shelf or in a curio cabinet. 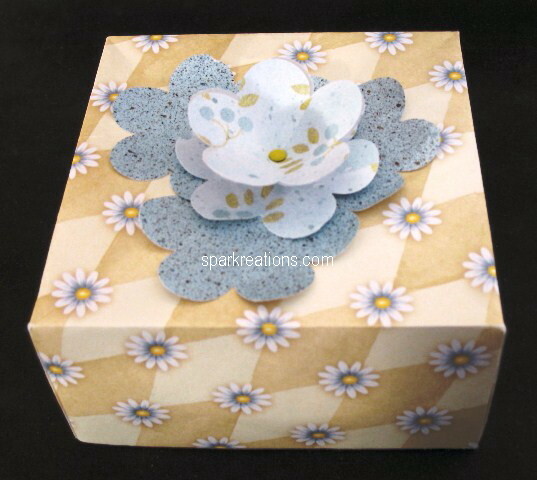 The artist creates the box and cover by folding a single sheet of paper for each, then fashions the decorative topper to complement the box. Cupcakes are everywhere these days! This one is worthy of celebrating the birthday of someone special, complete with a cherry on top. Other colors and textures are possible when formulating your custom design. Please take a moment to peruse the card collection for additional cards and other interesting creations. 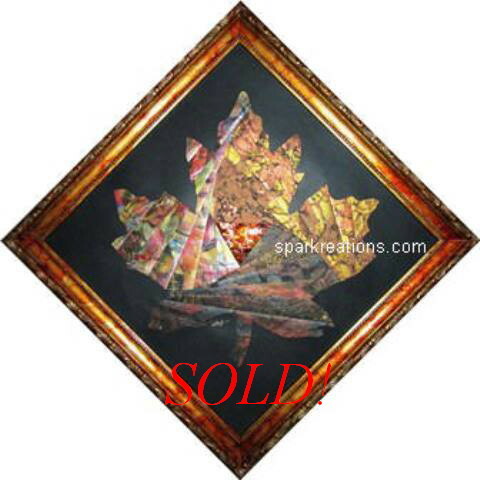 Sparkreations is delighted to continue the artist’s lifelong career in non-profit work. A portion of its profits will be donated to support the work of non-profit organizations of the artist’s choosing. The specific recipients will change periodically. Presently, all recipients have been identified. Solicitations will not be accepted and any correspondence seeking such will not be answered. The current recipient is StandUp for Kids, whose mission is to help homeless and street kids, through the efforts of volunteers who go to the streets in order to find, stabilize and otherwise help them improve their lives. The proceeds will directly benefit those served by the Worcester, Massachusetts program. Please click on their logo to find out more about the vital work that StandUp for Kids is doing to help at risk kids in your community.